FRANKFURT -- Audi plans to expand its production in China to 700,000 vehicles annually in coming years, starting with a new plant in the southern city of Foshan, where it will manufacture the A3 compact from 2013. "The FAW-VW joint venture, in which Audi has a stake together with Volkswagen and the Chinese partner FAW, will invest roughly 3 billion euros ($4 billion) in the model range, production and distribution of the Audi brand in China over the next five years," Audi said in a statement on Thursday. A spokeswoman for the company said the brand's current production capacity in China amounted to about 300,000 vehicles built in Changchun, where Audi A4, A6 and Q5 models are made. Including imported models like the A8 saloon, Audi forecast its sales would total a record 300,000 vehicles this year. The new factory in Foshan, in the southern province of Guangdong, will have a capacity to build about 150,000 to 200,000 cars from 2013, adding to output from the plant in Changchun which will be raised to as many as 550,000 cars, Audi said. The new plant will employ about 4,000 workers and produce a "new member" of the A3 compact line, the carmaker's third-best selling model, Audi added. Rising wealth standards and an increasingly important middle class have spurred a boom in sales of premium cars in China, making the country the most important growth market for Audi and its two German rivals, Mercedes-Benz and BMW . In a September study published jointly by the PwC consultancy and the German automotive industry association VDA, the two forecast "immense growth potential" for luxury carmakers like Audi as penetration expands to similar levels seen in the U.S. and Europe. "Were 15 percent of Chinese customers today to buy premium cars, then the market would have been 2.1 million vehicles in size," the study found. It forecast the number of high net worth individuals with more than $1 million in disposable income would grow by 2015 to 1 million. With a 78 percent share of the luxury market, German automakers are set to profit the most from this development. Daimler in June agreed with its local partner Beijing Automotive (BAIC) to invest 2 billion euros in their joint venture, which currently builds Mercedes C- and E-class sedans and will be expanded to include the GLK compact SUV and three premium compact models. As of 2013, a new engine plant in China will produce 4-cylinder gasoline engines, which will be used in locally produced Mercedes-Benz passenger cars and vans. 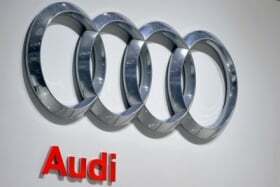 In October, Audi said it sold 27,729 cars in China, a rise of 62 percent over 2010 figures. This accounts for about a quarter of the group's overall sales in for the month. In the first 10 months, deliveries in China rose 32 percent to 253,739 vehicles.